Make someone's day truly spectacular with this large and gorgeous bouquet of richly colored blossoms. 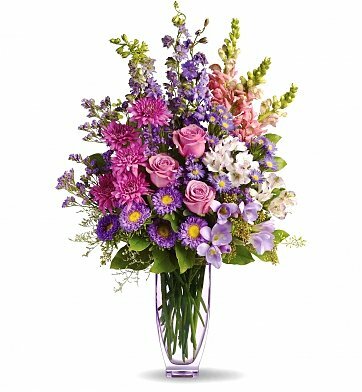 The arrangement combines garden-fresh flowers such as cheerful pink roses, charming pink snapdragons, and fragrant lavender freesia within a stylish glass vase. With its regal tones of pink and purple, the bouquet is a classically beautiful arrangement that makes a grand impression. Arrives in a stylish glass vase with fresh water. Wonderful Day Bouquet is a hand delivered gift. These gifts are delivered by one of our local design centers located throughout the United States and Canada. Same day delivery is available for most gifts when ordered before the cutoff time. The cutoff time for Wonderful Day Bouquet is 2 PM in the recipient's time zone. I already sent in a little email about how beautiful this bouquet was. I cannot get over it. I wanted to order one for myself it was so beautiful. Everyone here at the office was commenting on it. I told them all where I ordered it from. I ordered it for a co-worker for Nurses Week. Again thank you so much. It's not often we have a resident in our building that turns 100 years old. She was so surprised at how beautiful the arrangement was and how long the flowers have lasted. She stated that the delivery person was kind enough to bring them in for her. Got the desired response! Thank you! Delivered on time, good bouquet, similar to the one you have in the catalog. The recipient was absolutely stunned with how beautiful the arrangement was for Mother's Day. Delivered as pictured and on time. The bouquet was just like pictured and promised. It was sent in time for the occassion with our special note intact. I looked at a lot of websites and found you had the best selection of unique, colorful and best priced flower assortments. Thank you for standing out! Sent to our client and she took the time to write us a long thank you note and to tell us how beautiful this flower arrangement was. Thank you, you are a class act, always with good quality!